Hong Kong's legal ivory market fuels ivory smuggling and elephant poaching says a new report by WildAid, an international nongovernmental organization that aims to eliminate illegal wildlife trade. Together with undercover video by independent investigators provided to WildAid and WWF-Hong Kong, the report, Illusion of Control, released Oct 23 in Hong Kong, reveals that ivory traders routinely replenish their legally held private stocks with illegal ivory from recently poached African elephants. The report also details how complacent bureaucrats and a deficient regulatory system allow this to happen. 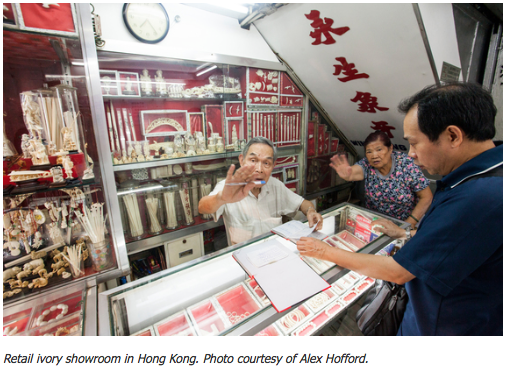 "Hong Kong ivory traders are no more than proxy killers of African elephants and have been operating under the nose of the authorities with complete impunity from the law for decades," says Alex Hofford, campaigner for WildAid and the report's coauthor. They operate within "a loop-hole riddled system" run by Hong Kong's Agriculture, Fisheries and Conservation Department (AFCD), which "has betrayed the elephant species through systematic institutionalized leniency and timid tolerance towards the city's ivory traders." Imports and exports of ivory have been outlawed in Hong Kong since 1989, when international trading in ivory was banned. But Hong Kong continues to allow domestic ivory sales by more than 400 licensed traders who can legally sell and use ivory from the pre-1989 private stocks. The idea was that domestic trading in Hong Kong could continue until the legal supplies ran out. Based on expected sales rates of ivory sales, the report calculates that "Hong Kong's stockpile of legal, licensed, pre-1989 ivory should have sold out by 2004." But instead the stocks have not only endured but remained relatively stable. Iain Douglas-Hamilton, the head of Kenya-based Save the Elephants, says Hong Kong is "raising its head as a weak link just as mainland China is getting its house in order and shutting down its ivory trade. One wonders why the Hong Kong stockpile hasn't decreased more." Hong Kong is the world's largest retail market for elephant ivory, with licensed businesses in high-rent tourist areas displaying more than 30,000 ivory items for sale--more than any other city in the world. 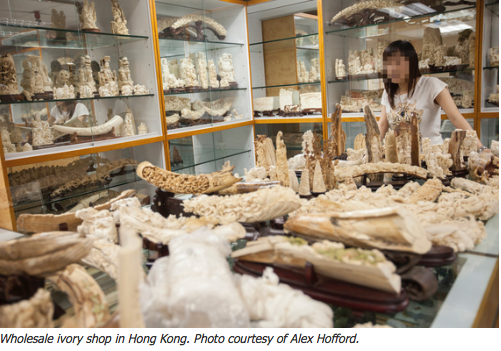 Hong Kong is also a major transit hub for illegal ivory. Regulatory weaknesses and limited oversight have allowed smuggled ivory to seep into the city's legal markets with little backlash. As one trader explains in the video, while these stocks were registered with AFCD, "the record was not in detail." Only the weights were recorded. The system does not connect any individual tusk or product to verified paperwork, so traders can easily replenish their stocks with newly poached ivory. "After I sell an [ivory] item, I can use illegal ivory to make another item to top up my stock again," that same trader said. 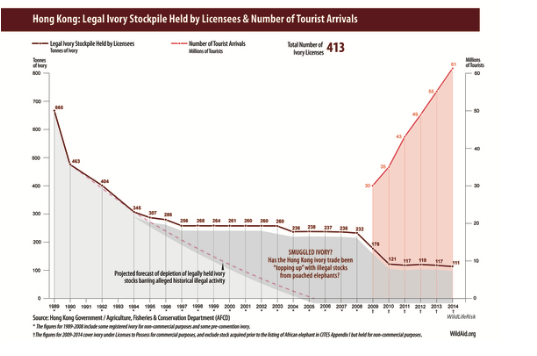 Further, there is room for fraud in the licensing system. 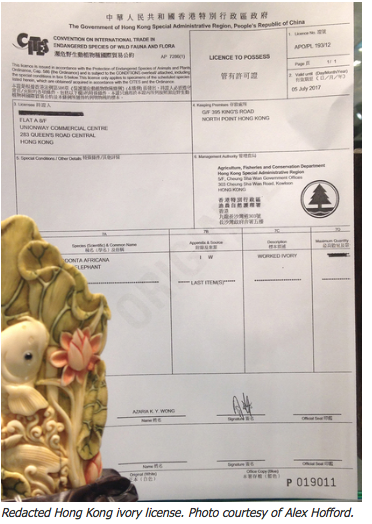 A survey of 94 shops by WildAid revealed that licenses often tampered with. The lack of verification and monitoring by AFCD contributes to the problem, as shady traders can slip illegal ivory into the system with little risk of getting caught. The undercover video also shows one trader saying that it's a simple matter to put in a purchase order for newly poached ivory. 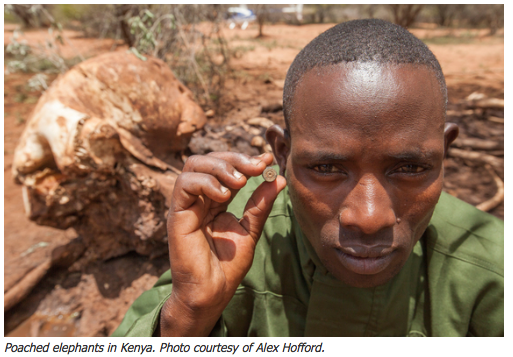 "If you dare [to receive the ivory], then I can send them to you from Africa," a trader says. Further, the WildAid report describes how ivory sellers routinely help clients circumvent the law by coaching customers on how to smuggle the tusks and, for tourists, provide false receipts for their trinkets. "I'm just selling it to you," a trader says in the undercover footage. "Where you go after that is your problem." As a key hub for ivory trafficking, closing loopholes in Hong Kong could go a long way toward stemming the trade. "History has shown that legal ivory sales only serve to provide a cover for illegal trade, which fuels the rampant poaching we see across Africa," says Peter Knights, the CEO of WildAid. "If elephants are to stand any chance at surviving, Hong Kong must join China and the U.S. in shuttering its market." This is an excerpt of an article on National Geographic titled "How World's Largest Legal Ivory Market Fuels Demand for Illegal Ivory" and was published with permission. For full article, please click here.